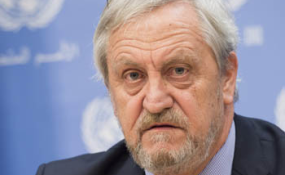 Haysom, who had only been in the post for three months, after a successful stint as UN Special Envoy to the Sudans, was thrown out because he criticised President Mohamed Abdullahi 'Farmajo' Mohamed's government for arresting Mukhtar Robow, a candidate in the presidential elections last December in Somalia's South West State. The federal government in Mogadishu secretly negotiated his defection and initially welcomed him. But after he announced his intention to run for president in South West State - against Mogadishu's preferred candidate - the federal government first tried to discourage him and then arrested him. This provoked rioting by his supporters in Baidoa, South West State's capital, which security forces violently suppressed, leaving at least 15 dead. Somalia's UN ambassador Abukar Dahir Osman later told the UN Security Council during a debate on Somalia that the UN shouldn't interfere in his country's national affairs. Former al-Shabaab militants 'cannot assume leadership positions without going through stringent established rehabilitation programmes', he was reported as saying, adding that a 'terrorist' should not be allowed to rebrand himself as an 'ice cream salesperson'. As he told the Security Council, al-Shabaab remains the major threat to Somalia's stability. Despite having been defeated on the conventional military battlefield, it is still inflicting huge casualties through terrorist attacks, mainly killing and maiming civilians. Al-Shabaab cannot ultimately be defeated militarily and so coaxing its leaders and followers to abandon violence is critical to the country's future. So Mogadishu ought to have nurtured Robow as the trophy in its campaign to inspire defections and a fine example for others to follow. Akinola Olojo, also an ISS senior researcher, agrees the incident has serious implications 'because not only will the mishandling of Robow's case discourage others who may be considering defecting from al-Shabaab; it risks reinforcing anti-government sentiments and narratives among the younger population from South West State and beyond'. The suggestion from Mogadishu that Robow was a Trojan Horse, pretending to have renounced violence in order to reintroduce it surreptitiously, seems disingenuous. It is however possible some of Somalia's regional and international allies were not comfortable with a former al-Shabaab deputy leader in such high office. The more plausible explanation, though, is that Farmajo's government arrested Robow simply because he was too independent. He refused to give way to the Mogadishu-backed (and therefore presumably more pliable) candidate for the South West State presidency, former federal energy minister Abdiaziz Hassan Mohamed - who indeed eventually won. This obsession with control, as Haysom hinted to the UN, is jeopardising efforts to tackle al-Shabaab both directly - in discouraging further defections, and indirectly - in undermining the construction of a viable federal state, which must rest on real devolution of power.